The Upland Sandpiper is an unusual shorebird because it is a grassland species, spending most of its life away from water. It is found on the breeding grounds in native grassland habitats from Alaska to central North America and into several northeastern states for as little as four months. The rest of the year it is in transit or on the wintering grounds in South America. While uncommon statewide during migration, it is more frequently encountered in Middle and West Tennessee from mid-March through mid-May, and again from mid-June through October. This species was once abundant in the Great Plains states, but has undergone a steady population decline since the mid-19th century due to prior unregulated hunting and habitat loss. Description: This tall, shorebird has a small, dovelike head, a long thin neck, a short yellow bill, and medium-length, yellowish legs. Adults stand tall and are cryptically colored with brown streaks above and white below with streaked sides. Juveniles (July-November) resemble adults. Voice: Flight call a low, strong, liquid, qui-di-di-du. Buff-breasted Sandpiper is much smaller, is unstreaked below, and more likely to be found on sandbars and open mud flats, though often around weeds. American Golden-Plover has a shorter neck, shorter bill, and black legs. Habitat: In Tennessee, found in large grassy pastures and fields, including airports and some croplands. Diet: Small invertebrates and insects. 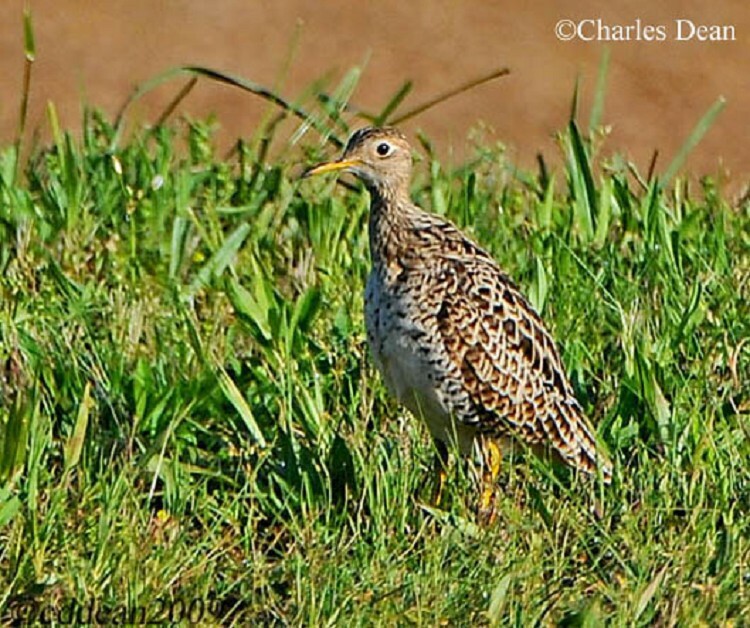 Nesting and reproduction: Upland Sandpipers have never been documented nesting in Tennessee. Status in Tennessee: This shorebird is a regular but uncommon migrant statewide, more often found in Middle and West Tennessee than in the East. It is usually found in spring from mid-March through mid-May, and in fall from mid-June through October. The Upland Sandpiper is capable of long flights, and individuals have been found in Europe, Guam, Australia, Tristan da Cunha, and Deception Island off Antarctica. Alexander Wilson named this species Tringa bartramia, Bartram's Sandpiper, in 1813 to honor the American naturalist William Bartram (1739 - 1823). He was unaware that German naturalist Johann Bechstein had already named it T. longicauda the year before. In 1831, this sandpiper was given its own genus Bartramia, therefore perpetuating Wilson's wish to honor Bartram. In several northeastern states, the majority of nesting Upland Sandpipers live on the grounds of airports. Best places to see in Tennessee: Ensley Bottoms in the grassy fields near the entrance to the sewage ponds is a reliable place in the right time of year. They can be found in large fields at airports. The sod farm adjacent to Bark Camp Barrens WMA is a decent place to find them in spring and fall after storms. Houston, C. S. and D. E. Bowen, Jr. 2001. 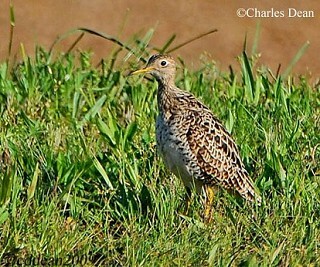 Upland Sandpiper (Bartramia longicauda), The Birds of North America Online (A. Poole, Ed.). Ithaca: Cornell Lab of Ornithology. Paulson, D. 2005. Shorebirds of North America. Princeton University Press, Princeton, NJ. Robinson J. C. 1990. An Annotated Checklist of the Birds of Tennessee. Univ. of TN Press, Knoxville, TN.